As part of our preview season for Ixalan, we are going to take a deeper look at some of the cards previewed on our own homepage. 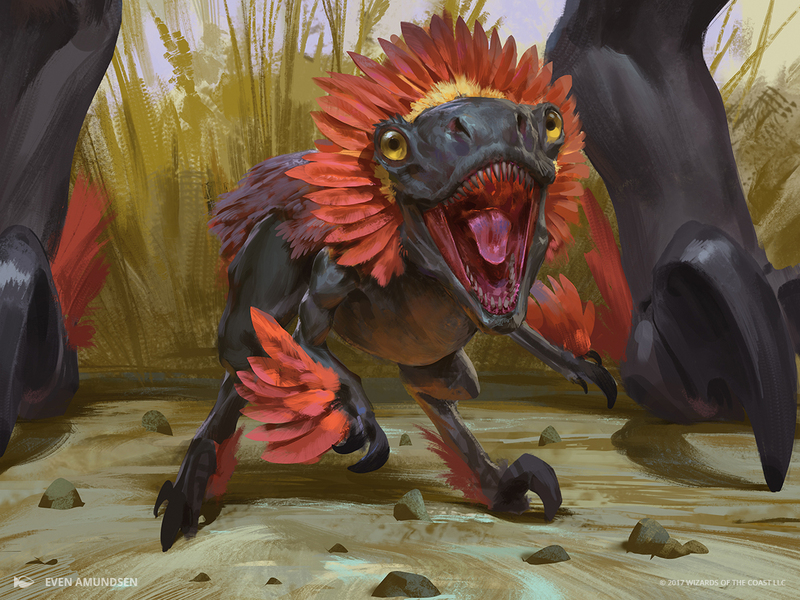 Today, we'll be peering behind the scenes of the process that went into creating the design and art of Raptor Hatchling, which was previewed in Gavin Verhey's article today! Big, splashy, monstrous Dinosaurs was the obvious design space for the creature type, so that's where design began. However, there came a point when the set team wanted to move in a different direction and explore what else Magic Dinosaurs could be. This led to the creation of a much smaller Dinosaur for the set with an inventive flavor twist: every time it gets hurt, the baby Dinosaur cries out, and its mother/father/caretaker charges onto the battlefield. R&D felt this flavor was a fun place to take a baby Dinosaur, and mechanically it the made creature into an excellent target for pump spells to keep it around for multiple triggers. Action: Show a young Dinosaur similar to a velociraptor or deinonychus. Its large eyes should suggest that it's a baby, though its sharp teeth and claws are fully formed. Its feathers are brightly colored. It is making an aggressive display toward an out-of-frame threat. (We might see the tail of a much larger Dinosaur disappearing off the edge of the frame.) Behind it, we see just one foot of the angry Dinosaur parent, coming to protect the baby. The foot anatomy and coloration should be exactly the same on both Dinosaurs to avoid the impression that this larger Dinosaur is hunting the small one. Mood: A brave little Dino pup, proud that it scared away a bigger Dinosaur and unaware that Papa Dino is right behind. Dinosaurs are unquestionably cool, and many of the larger members of the creature type show that well, so this little guy was meant to show different aspects to the tribe: they're fun and cute. The phrase "brave little Dino pup" has become a favorite among the art team because it captures the intended mood of this piece so well. Fortunately, Even picked up on this direction immediately and delivered an exceptionally cute Dinosaur that is certain to surprise and delight players.